This exercise strengthens the lateral line of the body and provides strength that will be useful when trying to balance. To do this exercise you will need a mat. 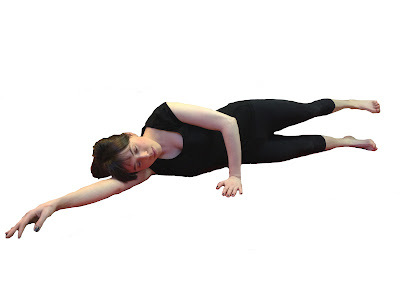 Start by lying on your side with your heels, pelvis, ribs, and head lined up with the back of the mat. Use your bottom arm to support the head, and exhale as you keep a gentle lift under your waist. Inhale into the ribs and then exhale as you reach through the top heel and lift the top leg to hip height. Inhale at the top and then exhale as you lower the leg down. Repeat 8-10 times. This exercise may not be hard at first, but after you finish a set of ten you should feel slightly tired in the side of you hip. If you feel this somewhere else then re-check the position of your pelvis and alignment. As you lift the leg the pelvis should be still. Often it will recruit muscles in the back, which will only hike the hip to the ribcage.